(Cannon Beach, Oregon) – This year, on June 9, the 2018 Cannon Beach Sandcastle Contest will celebrate 54 years of crowd-pleasing and wowing. The small town tradition has become big time industry over those decades, but the strange truth of it is that the Oregon coast’s most high profile festival owes its existence to something rather tragic. It was a tsunami that triggered the beginnings of the festival of sand sculpturing. It’s also apparently switched official names over the years. 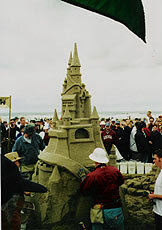 Recent references and publicity have it labeled Cannon Beach Sandcastle Contest, but earlier references show it as Cannon Beach Sandcastle Day Festival. The Sandcastle Day Festival began in 1964, not long after a tsunami washed out the bridge between the town and Highway 101. An earthquake in Alaska caused that destructive wave, which wrecked parts of Seaside, other parts of the Oregon coast, and killed four children down in the Newport area. The lack of a bridge left Cannon Beach locals a little stir crazy for awhile, but even once it was rebuilt, residents found the tourists weren’t coming back. 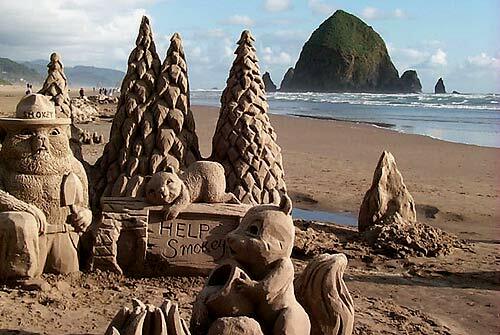 By early summer of 1964, Cannon Beach held the first Sandcastle Day Festival to help get them to return to town. The first one was a low-key event featuring mostly local sand sculptors, put together by Margaret Atherton, daughter Billie Grant and Marian Crowell. It was designed specifically for kids and families, and one of several efforts to draw tourists back to town. The second, in 1965, was more focused and a bit more publicized. A local newspaper article at the time touts the event happening on July 29. “Judges will be Gerald Gower, Cannon Beach mayor; Francis of the Cannon Beach Commercial Club; Frank Lackaff, local artist, and Mrs. Paul Dueber,” the article says. The prize that year was $10. Gower Street was clearly named after the then-mayor: it’s the road that leads to the main access to Haystack Rock in midtown. 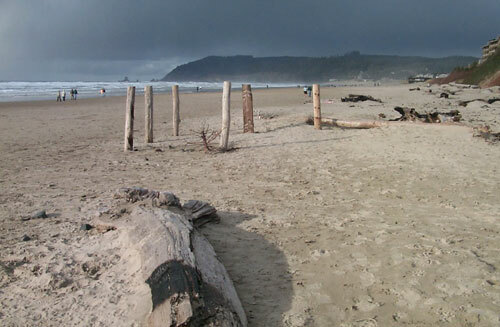 Summer fun on the Oregon coast would never be quite the same. After that, the Sandcastle Day Festival was usually planned around days with the lowest tides, which would happen in May, June or July. By the ‘80s it had grown to national and international fame, even featured on Good Morning America. 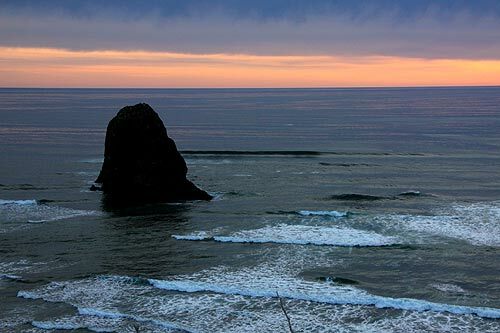 At one point, representatives from Cannon Beach were asked to help set up similar contests in San Francisco and North Carolina, and in 1984 the city of South Brighton in Australia asked for their assistance as well, according to documents from the Cannon Beach History Center & Museum. 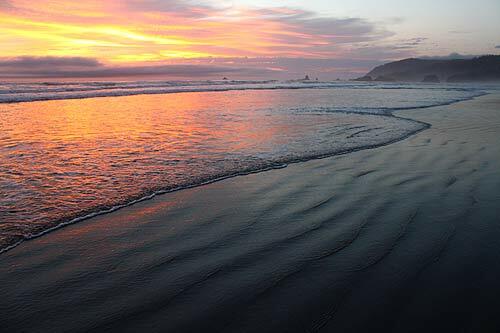 Since then, it has grown to enormous proportions and become one of the pivotal events of summer on the Oregon coast. It still is based on lowest tides, scheduled around that occurrence in May, June or July – although it has generally happened in June in recent years. 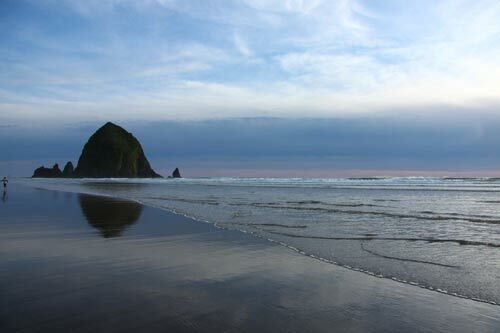 In 2014, on its 50th anniversary, the Cannon Beach Chamber put together a commemorative book called "50 Years of Sandcastles in the Making," showing historical photographs and all the posters of previous years’ festivals. These are still for sale: call the chamber at 503-436-2623.